Data hiding has been with us as long as there have been digital computers and networks. Some of us are long enough in the tooth to remember data hiding on tracks above 80 of the ubiquitous 5 ¼” double-sided, double density floppy drives in the late 1970's. It was not uncommon to store a program key on the upper regions of the disk for copy protection of PC software. The simplicity of this scheme was elegant: the DOS operating system would only recognize the first 80 tracks, so the program key would be lost during any DOS copy procedure. This became one of the more common techniques of data hiding in the early microcomputer era, although its effectiveness was short-lived because applications programs could access the out-of-standard tracks directly by bypassing the operating system function calls and accessing disk controller directly. This gave rise to a cottage industry of copy-protection-defeating (aka “pirating”) software as “bitsmiths” quickly developed controller-based copy software that rendered this form of out-of-standard copy protection obsolete. Now of only historical interest, data hiding techniques such as this led the way to more sophisticated approaches that remain with us today. Similar strategies exist for data hiding over networks. “Covert channeling,” is a case in point. Two popular covert channeling techniques, protocol bending and packet crafting, share the same out-of-standards approach to concealing data as the PC data hiding example above. Protocol bending involves the use of a network protocol for some unintended purpose. Typically, this involves embedding data in TCP/IP packets in unexpected places (akin to the higher level tracks in our floppy example). A time-worn tactic is covert channeling over Internet Control Message Protocol (ICMP) packets – e.g, by using the ICMP options field in each packet to convey applications-layer covert data. Since ICMP was created to transmit “command and control” information between network appliances such as network destination unreachable, source quenching, echoes (pings) and their replies, there is no expectation that applications-layer data will be included in ICMP packets. As a result, most firewalls and intrusion detection/prevention systems don't inspect ICMP packets. This is where the protocol is ‘bent.' This results in the establishment of a covert channel between network endpoints that lies under the radar of any network administration tool that assumes that ICMP packets will all conform to IETF specifications. Perhaps the most widely known ICMP covert channel tool is Loki, a program named after the contriver of mischief in Norse mythology. In the absence of exhaustive packet analysis, Loki traffic looks like any other routine ICMP request-reply pattern for pings, source quenching, etc., while in fact these ICMP packets are transmitting covert data. Another popular protocol bender is Reverse WWW Shell which uses a form of protocol bending called “shell shoveling” over HTTP. Covert channeling via protocol benders deploy protocols in non-standard and perhaps nefarious ways. Contrasted with protocol benders, are covert channeling tools that use packet crafting to embed data in the actual packet headers, themselves. Covert_TCP and NUSHU are two such examples. Covert_TCP uses active channeling where it generates it's own packet train to create the channel. On the other hand, NUSHU is a passive channeler that piggybacks on packets transmitted to the TCP/IP stack by other applications. The covert effect is the same. So there you have it. Data hiding in a nutshell from hiding application data on storage media or TCP/IP packets in places where the standards suggest it doesn't belong. In part one of this two-part column, we'll deal with physical data hiding on disk file systems. Covert data may be thought of as a small subset of dark data. There are many categories of covert data. Encryption produces dark data in the sense that while the existence of the data isn't hidden, its content is only readable and usable to those who have the correct decryption key. Steganography produces dark data that is typically buried within light data (e.g., a non-perceptible digital watermark buried within a digital photograph). Both are illustrations of intentional concealment. They share this characteristic with physical data hiding. The forensically interesting dimension of physical data hiding at this writing are those techniques that take advantage of the physical characteristics of formatted storage media to hide data. One early attempt to do this was illustrated by Camouflage (camouflage.unfiction.com) that hid data in the area between the logical end-of-file and the end of the associated cluster in which the file was placed (called file slack or slack space). Though primitive, hiding data in file slack has the dual advantage that the host or carrier file is unaffected while the hidden data is transparent to the host operating system and file managers. The disadvantage is that the hidden message is easily recovered with a basic disk editor. The ability to hide data on computer storage media is a byproduct of the system and peripheral architectures. If all storage were bit-addressable at the operating system level, there would be no place to hide data, hence no physical concealment. But for efficiency considerations, system addressability has to be at more abstract levels (typically words in primary, and blocks in secondary). Such abstractions create digital warrens where data may go unnoticed or, in some cases, be inaccessible. Where on disk may data be hidden? A formatted hard drive may be thought of as a logical structure mapped onto a physical medium. 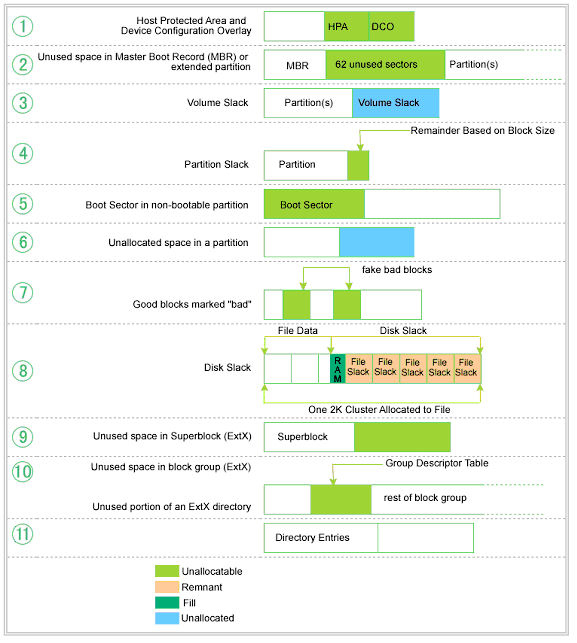 The logical structure consists of partitions, file systems, files, records, fields etc. The physical structure consists of disks, cylinders, tracks, clusters, sectors. etc. The absence of 1:1 mappings between the logical and the physical realms creates the digital warrens for concealed data. This has several implications. First, applications software and operating systems typically interface with the logical structure. Were concealed data on a disk, the typical user would never know it. More frightening, however, is that modern computer forensics tools are not designed to uncover all digital warrens. They typically focus on those disk areas that have already been observed to hold concealed data. This presents a major problem for law enforcement, because the more sophisticated hacker, criminal, or terrorist could take advantage of the disk warrens that are not easily found by current forensics tools. So, from a security and forensics point of view it's wise to approach the problem of data hiding from the point of view of what's possible rather than what's already known. For example, computer vendors commonly create two reserved areas when the format new computer hard disks: a Host Protected Area (HPA) for their proprietary software and data, and a Device Configuration Overlay (DCO) area for disk metadata. You've probably noticed the abundance of software that bears the name of the manufacturer that came with your computer for management, updating, diagnostics, etc. The manufacturer wants this software available to the user, and wants to make it difficult for the user to delete it. Such software would typically fit in the HPA. Access of these areas by an operating system is prohibited by the disk controller. This is the modern-day analog to our track 81-82 copy protection scheme that we described in the first paragraph of this column. The hack in this case would be to write a program at a low enough level to access the disk controller, and then hide the data in the HPA or DCO – not difficult at all if one knows the physical boundaries and boots to a non-host OS. Even within the OS, it's possible to reassign these areas to OS-control, change the contents, and then reassign them to HPA/DCO. This is an example of a hiding method that takes advantage of what is more or less a “physical” feature of the drive architecture. So, with a little sophistication one could bury covert data in either the HPA or DCO where it would be concealed from even the operating system! Further down in the disk hierarchy, we have the disk partition. Modern Operating Systems allow the administrator to re-define the number and sizes of disk partitions with any number of commercial and shareware utilities. It is fairly common to place the operating system (that is seldom modified) on a partition by itself and place all applications on another partition. In this manner, rigorous configuration changes to the applications software would be unlikely to affect the OS. Therein lies another opportunity to conceal data. Because the logical partition may not fit perfectly within the physical subdivisions of the disk, partition slack results. Partition slack is the area between the end of a logical partition and the end of the physical block the partition falls within. As with the HPA/DCO example, this partition slack space is unusable to applications and the operating system. Extended partitions exacerbate the problem by enabling a multitude of embedded logical partitions, each one of which is contains a digital warren of 62 sectors. If the partitions in aggregate do not use up all of the available disk space, volume slack results. One could easily create a multitude of partitions, load one with covert data and then delete it. Since deleting the partition does not delete the data but only the reference to it by the operating system, the data stays behind beyond the reach of applications and OS. Down further still, we have routine disk slack. It would be very unusual to find files that are exactly as long as the sector/cluster sequence they're stored on. At the sector level, any unused part of a partially-filled sector is padded with either data from memory (ram slack) or null characters (sector slack). After the padded sector, any remaining, unused sectors are simply ignored (file slack). Once again, the OS and applications have no access to this space as physically follows the end of an active file, but within the allocated sectors and clusters. You get the idea. Figure 1 lists eleven data warrens on file systems that are typically unobservable. Variations on this theme are endless. Without question, the most frightening side effect of these digital warrens is the inability of modern forensic tools to easily recover the data. With workstations now shipping with RAID 5 stacks and terabytes of disk space, manual investigation of hard drives at the byte level is simply not viable. In a sense, we've been living in a fool's paradise because today's crooks and criminals seldom take extraordinary measures to conceal data. Most of the forensics work in law enforcement that I'm aware of involves very basic data recovery techniques with a few popular forensics tools. Even encryption and thorough disk wiping is. However, it would be unwise to expect this to continue, as crooks and their misdeeds become more sophisticated. For simplicity, we'll illustrate the principle of covert data hiding on a hard disk with a simple example based on the old FAT 16 format. The relevant design consideration is a 1:1 mapping between the entries in the file allocation table and the physical clusters on the disk. For example, a FAT entry of hex 0000 indicates that the corresponding cluster on the disk is free for use. A hex value of 0002-FFEF is a pointer to the next cluster on the disk that is part of a file. Hex FFF7 indicates a bad cluster that has been culled so that it can't be reallocated. You guessed it, our simple example will involve changing some entries in the FAT from “free” to “bad,” and then storing data on the bad clusters. In our case, we modified the FAT to show clusters 24-29 as bad, and then stored a GIF file on those clusters. The OS sees the clusters as bad and won't access them, so the data is covert from the OS point of view. But suppose we look at this forensically. A mainstay of modern forensics tools is a file carver. File carvers attempt to reconstruct the disk contents without using the operating system's meta-level information. Figure 2 shows the result of looking at our disk with a modern file carver. We observe that the file carver ignored the file's “magic number” identifier that revealed it as a GIF graphics file, and simply reported the clusters as a lost file fragment – i.e., it saw something there, but didn't look to see what it was so it, erroneously, assumed that it must have been data residue from a broken file allocation chain. This is analogous to network administration ignoring the contents of the options field of an ICMP packet. It isn't a question of “whether” covert data is being hidden on hard drives of unsuspecting users, but “what” and “for what purposes.” Well-funded hackers, criminals and terrorists are already hiding the data, while law enforcement tries to catch up with the latest tactic of the day. Challenged by resource limitations, they must rely on the technical community to help provide solutions and motivate vendors to pay closer attention to such potential security breaches. Slacker : a automated tool for storing files in slack space, and to appear in the near future. Transmogrify : A tool to defeat file signature analysis. The importance of this burgeoning art of anti-forensics can not be over-stated. Imagine the impact on law enforcement if fingerprint evidence was unreliable and iris scans could be easily spoofed. In many ways, anti-forensics is scarier than network hacking. It offers the triple threat of hiding covert data, manipulating system data to exonerate a criminal, and planting system data to implicate an innocent party – without leaving behind telltale evidence! Out-of-standard disk copying software has passed into the digital dustbin. Trade magazines of the late 1970's and early 1980's would reveal widespread use of such software among computer enthusiasts of that era. Loki (www.phrack.org) has been a premier covert channeling tool for Unix systems for many years. Although it is widely associated with ICMP, in principle it could use any protocol that is unlikely to be subjected to close inspection by network security appliances. Unless the packets are analyzed, the Loki transmission looks innocuous (e.g., an ICMP “ping request”, a UDP “DNS query,” etc.). Loki can encrypt all data for additional stealth, and swap between ICMP and UDP on the fly. For further detail on the ICMP and UDP packet formats, see our Packet Pal Primer at www.berghel.net/resources/packetpal/index.php. Another approach to covert channeling is the reverse WWW shell (aka, shoveling shell) developed by van Hauser in the late 1990's (www.megasecurity.org/Sources/rwwwshell-1_6_perl.txt). Like Loki, reverse WWW shell requires a server daemon to be running on the server. The daemon submits outbound HTTP requests for commands from an external computer. The intruder's command is contained within the HTTP response. The command is executed on the compromised computer, and the results are subsequently shoveled to the intruder via a stream of outbound HTTP packets. The HTTP traffic that contain the covert data appears to the network to be routine Web surfing. Where Loki and reverse WWW shell establish the covert channel over an embedded protocol by means of protocol bending, other techniques exist for establishing a covert channel by means of packet crafting. Craig Rowland's Covert_TCP ( www.securityfocus.com/tools/1475) and Joanna Rutkowska's NUSHU (http://invisiblethings.org/papers/passive-covert-channels-linux.pdf) are two such examples. Covert_TCP creates “active channels,” i.e. the daemon actually generates packets with data buried in the either the ID field of the IP packet, or the Sequence or Acknowledgment Number fields of the TCP packet (cf. www.berghel.net/resources/packetpal/index.php). By contrast, NUSHU creates “passive channels” by embedding the data in the SEQ and ACK fields of existing packets by adding an offset (data value) to the existing sequence number. The sequence of offset values is the covert data. The daemon just has to remember to subtract that offset from the returned sequence number to fool the application. nu shu, incidentally, means “woman's writing.” It is a apparently a secret language developed by Chinese women. “ Traditional Chinese culture is male-centered and forbids girls from any kind of formal education, so Nushu was developed in secrecy over hundred of years in the Jiangyong county of Hunan province.” - www.crystalinks.com/nushu.html. Dark data/digital dark matter is usually used in some search or indexing context. See Paul Chin's 2005 summary of dark data within intranets (www.intranetjournal.com/articles/200507/pij_07_07_05a.html) or the recent discussion on the recent PC Forum blog where Yahoo's Jeff Weiner estimates that 99% of the worlds collective knowledge is dark data - blogs.zdnet.com/BTL/?p=2715. Cryptography, steganography, and digital watermarking have been extensively reported in the professional literature, so a Web search will provide millions of links. For readers interested in file carving and disk wiping, consult our August 2006 column in CACM. Finally, for a more thorough treatment of the topic, consult Hal Berghel, David Hoelzer and Michael Sthultz, “Data Hiding Tactics for Windows and Unix File Systems” at www.berghel.net/publications/data_hiding/data_hiding.php , and the February, 2006 section of CACM on Next-Generation Cyber Forensics.